As I walked through the lobby of the assisted living facility, I saw him again – the elderly gentleman whom I had greeted three hours earlier. Had he been there all morning? I wondered. I was on patient rounds in the building that day, visiting the residents that staff had identified as needing to be seen. It was a busy morning as usual but the elderly gentleman was not on my list. When I first arrived, I greeted him quickly but my mind was focused on my work. Now I was back in the lobby and I stopped in surprise when I saw him staring longingly out the big picture window. I slowed down my stride and went to him. We exchanged greetings and talked about the weather. He seemed lonely and all of a sudden my schedule wasn’t so pressing. Pulling up a chair, I spent some time with him, mostly listening while he reminisced, recalling memories of people, events and times gone by. “Have you been sitting here all morning?” I asked. He explained that he didn’t like to sit alone in his unit. He liked to be around activity. His loneliness was so palpable that it hurt. Unfortunately, this gentleman is not unlike many elderly people who live with a great sense of loneliness and of being forgotten. 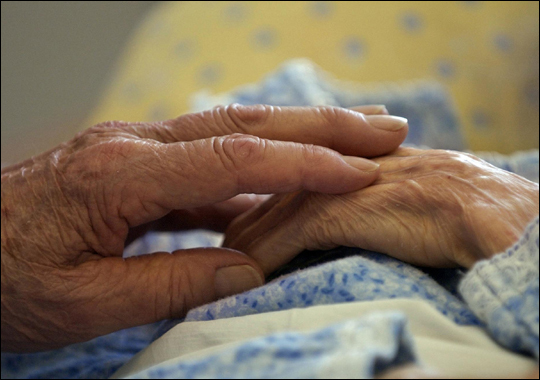 They have experienced many losses: friends, family, spouses, health, independence. The feeling of being alone is more acute in times of traditional family holidays and may cause depression. The Advent and Christmas seasons with their focus on relationships is an especially difficult time. It’s not the seasons themselves that are the cause but the memories of happier times often associated with family and friends. Even seniors who have family support may succumb to the “holiday blues” or full-blown depression. Being surrounded by family during these times may actually intensify feelings of sadness due to the memories of deceased loved ones. As well, they may be reminded of things they can’t do anymore or memories of regret. It’s important to be able to recognize the symptoms of depression which include the following: irritability, sadness, feelings of worthlessness, anxiety, loss of interest in daily activities, loss of appetite, increased fatigue, lack of personal grooming and hygiene, suicidal thoughts. We can very easily get caught up in our own lives, but for the sake of our senior family members, we ought to be vigilant of their mood, especially during family-centered times of the year. We are a relational people. God made us to be in relationship, to share our lives with others, to support, console, validate and love each other. That doesn’t stop at a certain age. On the contrary, in the later stages of life when our bodies and maybe our minds slow down and when we experience the loss of loved ones , our growing dependence on other people means that our relationships take on a different but equally necessary meaning. Three popes of modern times have highlighted the plight of many of our elderly brothers and sisters. With a steady worldwide increase in the number of elderly people, this problem will continue to grow. Having a compassionate heart means meeting people in their particular situation in life and ministering to them there. What can you do to spread the love of God and to bring His message of hope and love to the elderly who are forgotten, lonely, and isolated?